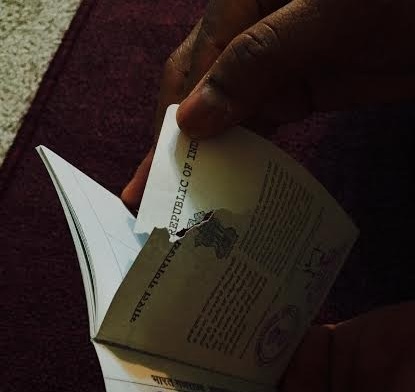 Hi All, My passport first page got ripped. Front side of this page has a Indian emblem and backside is a blank with no stamps or Visas. Other pages including visas, personal details, POE stamps everything looks good. Basically a brand new passport with more than 7 years validity. Will this be considered as damaged? Please help me with your answers ASAP as I have a travel plan to India end of this month for my own wedding. This damage happened accidentally when I was scanning the pages. I think it is better to err on the safe side here and get a replacement passport. Whilst it might be a minor damage, page rips aren't usually considered as wear from normal usage. Normal wear of a U.S. passport is expected and likely does not constitute "damage." For instance normal wear includes the bend of a passport after being carried in your back pocket or fanning of the visa pages after extensive opening and closing. Indian passport with two missing (ripped out) pages - should I get a new one to enter the US? Can I expect problems flying to the Netherlands with a damaged Albanian passport? Water Smudge Marks on Passport_ Can it be Considered as 'Damaged'? Name and emblem of country no longer visible on front of passport — is it “damaged”? My Indian passport's first page is a little damaged. Is it going to be a problem?